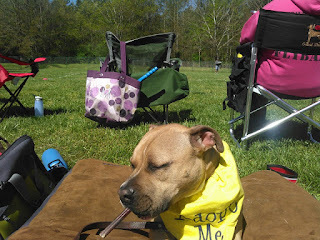 Last weekend marked the beginning of my first dog sport competition. 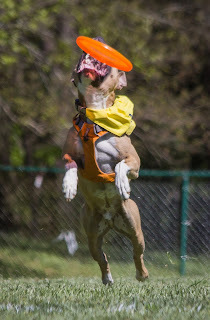 I'd always wanted to dabble in dog sports but had never mustered up the initiative to muddle through the process of finding, entering, and showing in an event. This past weekend fell into my lap in an unlikely series of events that began with a shelter dog and a rule: no toy play with volunteers. Mild-tempered Stuart arrived at Paws4ever Animal Sanctuary in October 2015. Cuddly, calm, and extraverted, he seemed like the perfect potato to grace a television fanatic's couch. But there was one exception: toys. Once a toy appeared, Stuart's mind disappeared. His teeth would chatter in anticipation, his eyes would go wide, and his mouth would grab desperately for the toy without any regard for people or objects in the way. With zero impulse control around toys, our affable powerhouse was quickly deemed unfit for toy play with volunteers. Meanwhile, staff began slowly working with him to teach him from the ground up how to engage in appropriate play. I started with a boring metal dumbbell and his mealtime kibble. I used free shaping and back chaining to teach a formal retrieve-to-hand. Instead of a clicker, I used the word "drop" to cue the delivery of a reward. Once Stuart was performing perfect retrieves with an enthusiastic "drop", we moved to a wooden dumbbell, then a metal dish, and then - big step - a durable ball. Each time he dropped the ball for me, I reinforced with high-value treats, affection, and play with an identical ball. In other words, we conditioned "drop" to mean that he was getting something better in addition to not losing whatever he already had. Once he was on the ball with this game, we moved to discs rolling on the ground, then flying in the air. Eventually, we incorporated tugging on cue into his repertoire of behaviours that he could perform while thinking and communicating. Stuart still got excited over appropriate toys, but it was a controlled frenzy. And then came the arrival of UpDog - a new disc dog venue - not only to North Carolina, but to Paws4ever itself! Needless to say, we entered. Stuart relaxes while another team competes. As Stuart was now able to engage in structured play with a handful of people, I was able to focus on calmer behaviours, such as teaching him to not only go to place but to settle there and truly relax. We were conditioning him to separate intense work and play from just chilling, which he was already fairly good at to start with. We also worked extensively on incorporating low-arousal toy play into his basic obedience, especially heelwork, while also rewarding with food. This is an important bit: arousal refers to activation of the sympathetic nervous system, which depresses the digestive system, so an over-aroused dog will not eat. Conditioning Stuart to switch seamlessly between toys and food was an integral part of that essential on/off switch. We again started with balls and high-value treats until he was able to happily accept food while in the presence of balls, then rope tug toys, then more enticing tug toys, and finally (pictured right) while another dog is catching flying discs behind him. Stuart still cannot accept food during an actual play session with discs, and this is something that we are working on, but I am already quite happy with our current results: he can relax and accept food while a disc rolls or flies past him, or when he's playing with literally any other toy. In other words, his toy craziness hasn't been diminished, but it has been channeled into a very specific type of toy, only when it's his turn, and only in a very structured, safe game that doesn't just happen by accident: Stuart has achieved a balance and well-defined separation between controlled crazy and calm companionship. What goes UpDog must come DownDog. What goes UpDog must come DownDog. Well, sort of. We could have just turned Stuart into an adrenaline junkie. Many working dogs cannot settle down. They're always up, and they never come down, spinning in their indestructible crates while other dogs work. But channeling your dog's Up gives him the outlet he needs in order to be taught to chill Down. Both sides of training are equally important, and both sides of life are beneficial to both your dog's well-being and your sanity. 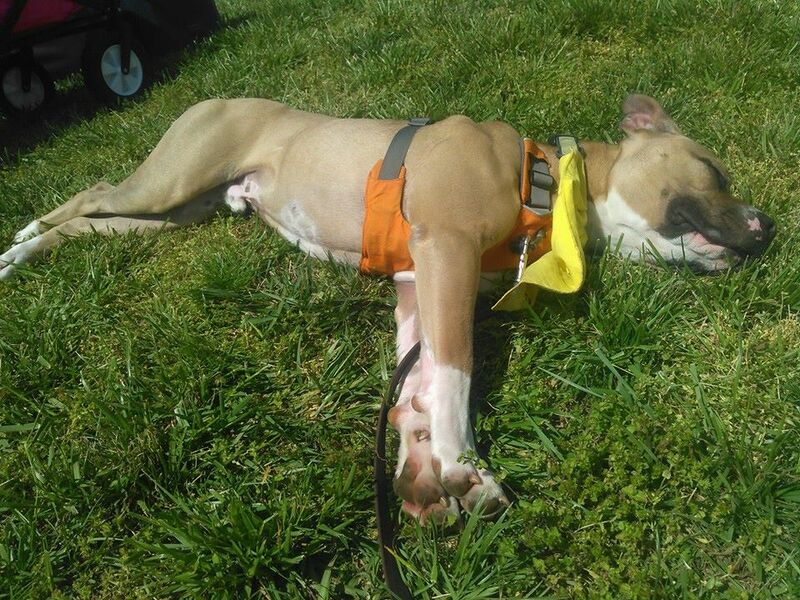 You can't take a crazy dog and teach him to be chill all the time, and you can't expect him to naturally chill at home just because you exercise him regularly. But train the Up and train the Down, and you'll find that your crazy dog might just have a calm side that can be cultivated into the perfectly versatile canine companion. If you have any questions about fostering or adopting Stuart, please contact Paws4ever directly at 919-241-8438 or adopt@paws4ever.org.